Tommy Wiseau finally won. Some 14 years after coming up with the brilliant idea of featuring himself and his writing/directing/acting talents in a stand-alone tour de force known as The Room, he is now a household name. He is a myth made real, a man longing for fame and recognition who has achieved both, in abundance. Granted, he may not enjoy the fact that his magnum opus is now a Rocky Horror style audience participation experience, with eager viewers shouting back lines and accenting the movie with their own props and punchlines, but instead of a forgotten bit of cinematic ego, The Room has take its place in that pantheon of pathetic exclusives–the cult classic. 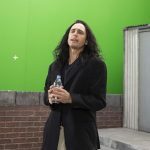 Wiseau has even more reason to puff his chest, as Oscar nominee James Franco (127 Hours) has seen fit to create a love letter to his lunacy, a spot-on adaptation of Greg Sestero’s behind the scenes tell-all, The Disaster Artist. Doing his own version of The Room–though he merely stars and directs, leaving the clever scripting to Scott Neustadter and Michael Weber–he chronicles Wiseau’s dream from beginning to bizarro world end, while avoiding some of the material (the man’s very secretive past) to the pages of non-fiction. Though it will be viewed as another Hollywood bow to those brazen enough to put their desires into action ala Tim Burton’s Ed Wood, The Disaster Artist is different. The man who made Plan 9 From Outer Space didn’t really strike out to make a statement. He just wanted to be part of the business they call show. In fact, one could argue that Wood is more Bela Lugosi’s picture than a biopic of the auteur often cited as the worst director of all time. In Franco’s mind, The Disaster Artist is 100% about Wiseau and his vision. 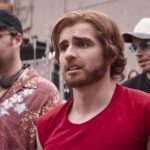 While Sestero (played by Dave Franco) is involved, their eventual bond and friendship is more about the latter’s attraction to the former’s freaked out perspective than it is a tale about two guys taking on Hollywood together. Sestero meets Wiseau at an acting class, where his inhibitions are matched against the future filmmaker’s outright fearlessness. While the more conventional man gets an agent (Sharon Stone) and small roles here and there, it is his far wilder buddy who sees the door slammed in his face over and over. On a whim, Wiseau decides to self-finance a passion project which he calls “The Room.” He offers Sestero the role of Mark, and also an executive producer’s credit. After casting, the film goes into production and it’s a mess from beginning to end. Wiseau envisions a run for the Oscars. Sestero hopes his career will survive such a decided debacle. What we get is a hilarious buddy pic that shifts between the strange bond between these Tinsel Town wannabes and the worrisome production. Wiseau is clearly enamored of the possible acceptance fame could bring him. For Sestero, it seems more personal. As one of the many marginal talents trotting out to audition after audition, he just wants some manner of acceptance and inclusion. The Room offers this, albeit in a way neither individual could imagine. Perfectly directed and acted by Franco, this film reminds us all that, sometimes, it’s better to pursue your dreams than to let them sit and stagnate. In Wiseau’s case, he won. He got his movie made. It’s become a “so bad it’s good” institution. He’s parlayed his notoriety into a cottage industry, making appearances on TV and in other films. He got what he was looking for. So do film fans with The Disaster Artist. It’s one of the year’s best.